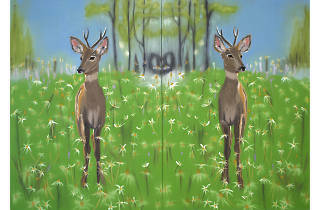 Ann Craven, 'Young Buck (The Life of the Fawn), Facing Left and Facing Right', 2005. Courtesy the artist and Southard Reid. Photo: Ann Craven Studio. 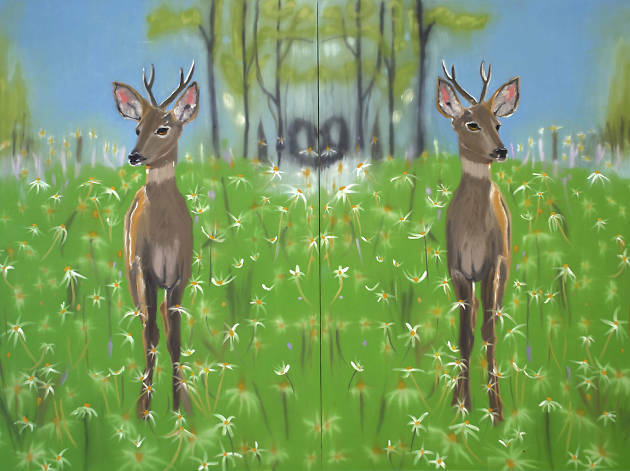 Ann Craven’s show is an adorable menagerie of cutesy animal paintings: soft-eyed pandas, kittens playing in the grass, deer in meadows. They are ultra saccharine, obscenely chintzy and a bit bloody awful. But there’s more to it. The images, taken from YouTube or pop-culture sources, detail a human obsession with escaping into the safety of nature: the cultural comfort blanket of sweet, innocent animals. The paintings are basically meditations on images such as the ‘hang in there’ kitten, or the hours you spend squealing at adorable baby animal videos on the internet in a bid to soften reality’s edges. It takes a bit of a mental jump to get over the fact that these aren’t just bright-pink animal paintings that you might find in a kid’s bedroom, but if you make that leap you’ll never watch a cat video in the same way again.